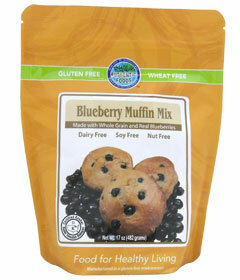 Now blueberry muffins are so easy to make with the Authentic Foods Blueberry Muffin Mix! Just add eggs, oil and milk (or non-dairy substitute), pour the mix into muffin cups and bake the muffins for some great-tasting blueberry muffins fresh out of the oven. This blueberry muffin mix is made with real blueberries, so it is a great way to get in some antioxidants! Each muffin will have just enough blueberries to satisfy your cravings and help wake you up in the morning. In addition to blueberry muffins, you can also make magnificently tasting blueberry scones. Check out our recipe section for details. This mix makes 12 blueberry muffins or 24 mini blueberry muffins.